There are so many new and unique offerings being added to Downtown Disney as it continues to make the transition to Disney Springs. One of these is the ride in an Amphicar. 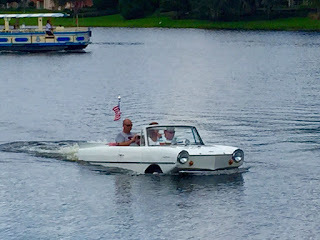 It is certainly interesting to see a car drive right into the lake, or a boat drive right up onto the street. I took this shot today, while in the area of the new Boathouse restaurant.